It isn’t too often that the Insider gets the chance to interview a world champion. Sure, two-time NBA champion and Concord native Matt Bonner of the San Antonio Spurs famously hung out with the previous Insider regime in 2014, hitting up some of the basketball star’s favorite local spots with the championship trophy in tow. Bonner also invited the Insider to hang out with him in July 2015 during his youth basketball camp at Rundlett Middle School. But that was then. I, personally, was not even part of the Insider back then, so as far as I’m concerned, it never happened. Luckily, my chance came last week, when a seemingly throw-away press release came in from the New Hampshire Lottery. Normally the Insider wouldn’t have much, if anything, to do with a press release from the lottery, but this one had a big name in the heading: David Ortiz. The legendary Red Sox slugger who won three World Series titles in Boston – including the curse-breaking, 86-year-drought-ending 2004 championship as well as the improbable 2013 title, punctuated by Ortiz batting an otherworldly .688 in the series, earning him World Series MVP honors in the process – was in Concord for, of all things, the release of a new scratch ticket to commemorate the Red Sox’s 2018 World Series championship. Oh, and he was also here to play some Keno, but since we all know our fine city strictly prohibits the bingo-style game, he had to take his talents to Manchester to get in on that action after he was done talking about the scratch ticket here. 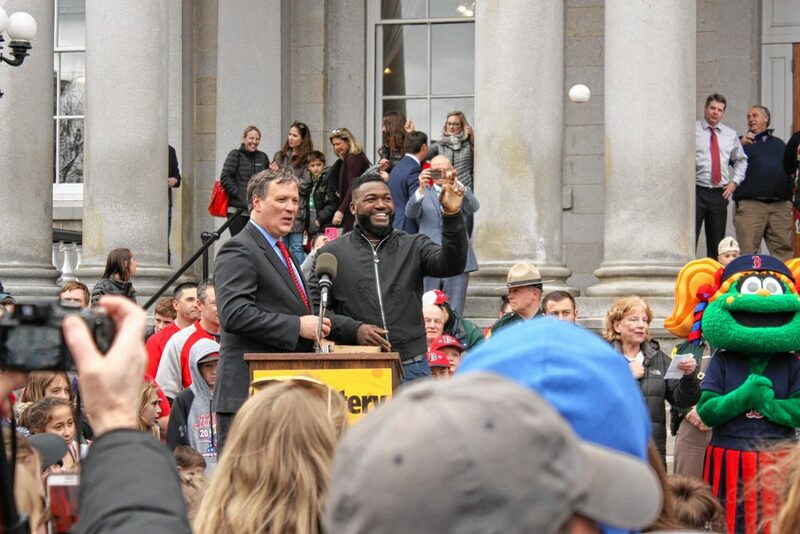 The event, which took place in front of the State House, also featured Red Sox mascots Wally and Tessie, who were busy working the crowd of more than 100 but probably less than 200 for about an hour or so before the man of the hour arrived. Youth baseball players from Bedford and youth softball players from Keene were also on hand, in full uniform, to meet the larger-than-life superstar. Ortiz began the event by meeting with the youth teams inside, or so we were told by the media relations representative at the event. Kids came pouring out of the State House minutes before Ortiz did, comparing each other’s signed hats and shirts. 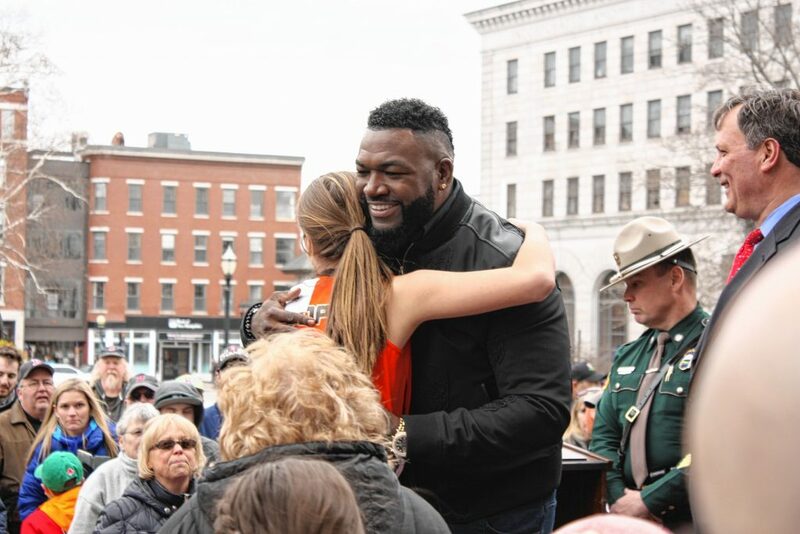 Then, after close to an hour of waiting outside (for me, anyway – others no doubt were there long before I arrived) in 39-degree weather, Big Papi strolled out of the State House doors and came down to a podium on the ground. He had no Sox gear on, save for that unmistakable bling on his left hand, blinding the crowd every time a ray of light touched it. That bling was, of course, one of his World Series rings. 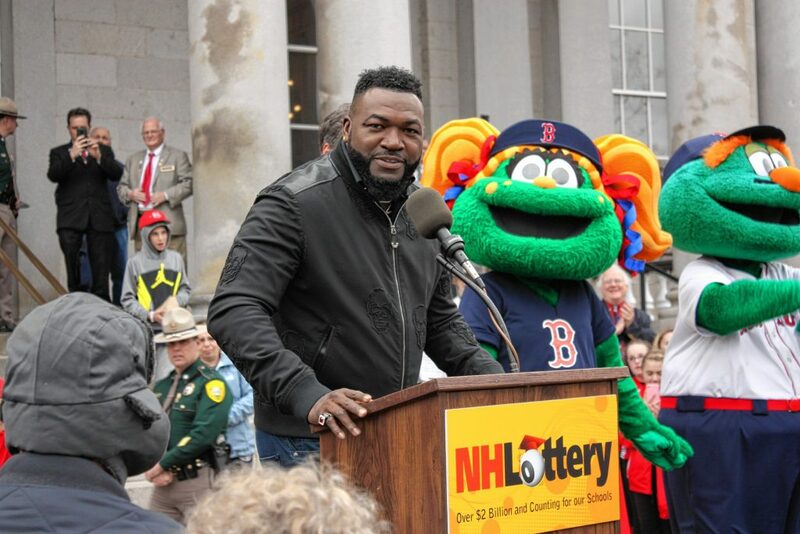 While Ortiz is one of few people who really requires no introduction, formalities are formalities, and New Hampshire Lottery Executive Director Charlie McIntyre took a few minutes to introduce the slugger before Ortiz took the mic himself. It may have been a touch cheesy, but we commend McIntyre for asking Ortiz whether he would come back out of retirement to play for the Sox again – we had planned on asking the same thing, actually. Eventually Ortiz took the mic and addressed the crowd, however briefly. He spoke for probably about 5 minutes, heaping praise on the lottery for providing more than $2 billion for public education over the years. He also explained how the new $5 scratch ticket – a 2018 World Series Champions edition ticket – would offer players the chance to win a $100,000 grand prize as well as second-chance drawings for Red Sox tickets. Those over 18 who got there early enough – including this reporter – were given a ticket to try out. In the least surprising news of the day, our ticket lost, but it was fun for those 25 or so seconds to dream about what could’ve been. After Ortiz spoke about all the great things the lottery has done, he played catch with the youth baseball and softball players who attended the event with their teams. Then he tossed some foam baseballs out into the crowd, some of which were, supposedly, signed by the postseason hero, though I personally did not witness a ball with an autograph on it. Before hopping into his limo and heading to three Manchester establishments to try his hand at Keno (again, wouldn’t it have been nice if he could’ve just gone right across the street instead? ), Ortiz stopped to answer some questions from the media. Unsurprisingly, most reporters had no interest in the actual lottery event. Questions mostly regarded the 2019 team’s struggles, Ortiz’s life after playing and tips for other star athletes heading into retirement. “Sometimes it’s good to get the struggle out of the way early so you know that it’s not that easy,” he said of this year’s team’s horrendous start. “These guys are going to regroup,” he told another reporter. He asked me to repeat the question, so I did. He paused for a second to think about it before revealing the answer: “Like, 2 bucks?” Uproarious laughter then ensued. So there it is – Big Papi, World Series champion, clutch hitting guru and owner of more jewelry than Zales – really is just like the rest of us after all.